When we think about countries with strong chess traditions, Iran does not spring quickly to mind. More likely we think of Russia first, then other former Soviet nations, along with India and China, and maybe the United States. As for Iran? Well, they were seeded 39th at the 2014 Olympiad, and finished in the massive tie for 35th through 60th places. With just 9 GMs in the country, and only two players currently rated 2500+, Iran is not exactly a chess powerhouse. Right now. The next decade could well see that change, however. Iran boasts 5 of the 65 highest rated players in the world born this millennium, along with a handful of other talented players sitting just outside the top-100 of the U15 rankings. And the star of this group of promising youngsters is Alireza Firouzja, currently the #1 ranked U12 player in the world! Firouzja’s peak rating of 2332, achieved in the November, 2014 rating list, is the 11th highest rating ever achieved by a player under 12 (higher than Wei Yi or Magnus Carlsen’s ratings at the same age). 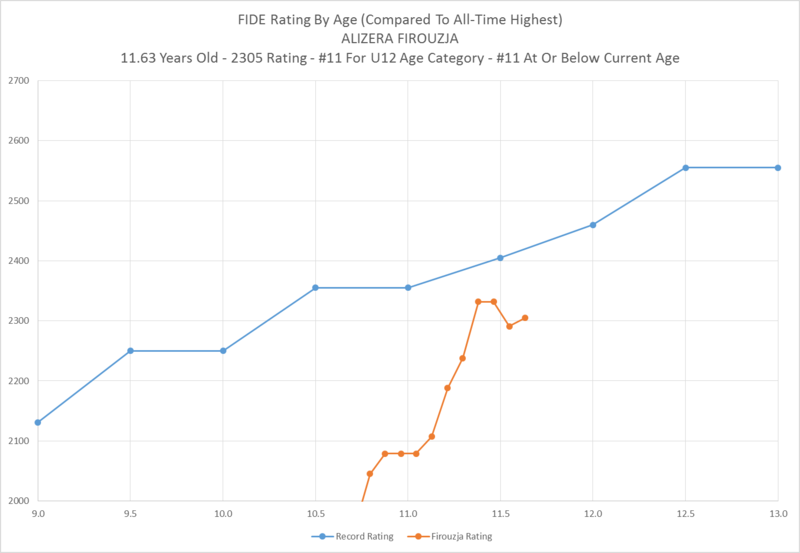 While the rating dipped in January, even Firouzja’s current 2305 mark is good enough to rate as the 11th highest at or before his current age of 11.63 years. At the time of this post, Firouzja is currently competing in the top group of the Khazar International Open, where he will have the opportunity to compete against foreign GMs and perhaps achieve a new higher peak rating with a strong result. And perhaps in another decade Firouzja might find himself headlining an Iranian team that is placing significantly higher than 35th in a Chess Olympiad! Note: This youngster’s name is correctly spelled “Alireza Firouzjah”, per Iranian chess news site Achmaz, but for this article we will use the name as it appears in FIDE’s registry.